Well, this will be the last blog entry for a while as I leave this morning for my sisters in Vancouver, WA. I am totally in the Christmas mood now. Last night was the Christmas concert that the Mormon Tabernacle Choir does annually. It had a Norwegian theme with special guest singer Sissel. It was just wonderful as always!!!! This was followed up with a Christmas concert from the St Olaf College Choir from Northfield Minnesota. I really love Christmas music and these were two wonderful programs!!!!! I hope everyone has a wonderful and safe Holiday!!!! I worked on exchanges last night for a little bit. We had some friends over for Christmas dinner and a present exchange so there really wasn't much time for much else. But, yesterday here at work there was a devastating fire just a couple of doors down Mission street. I get in here at about 6:15/6:30 am...I like to start early and nobody else gets in until about 9 so I have lots of quiet time to do what needs to get done without interruption. Well, when I got in I noticed a fire truck down the street putting out a fire and did not think much about it as that happens all the time south of market. At 9:30 when I was walking back from the post office I could see numerous fire trucks, hook and ladders and firemen pouring water onto and the same building. I could even see huge flames pouring out of where the roof should have been. At 12 pm I walked out to go to lunch...by this time Mission street had been blocked off at 8th and 7th streets and not only where they still pouring water into the building by also foam. I went to my usual Pizza place on the corner of 7th and mission after cutting across the street. I ate my little piece of sausage, peperoni and mushroom pizza slice, it was the special of the day. I usually sit there and read until 1:00 pm but yesterday I just couldn't stand the smoke pouring down the street which in turn was seeping into the Pizza Place. I then tried to walk back to work and the police would not let anyone pass back up Mission so I had to walk up to Market street down to 8th and then back to Mission to get back to work. This morning Mission Street is still blocked off and there is still and fire truck with extended ladder at the building with firemen walking around. Here are some snaps from about 12:45 pm yesterday. This is looking east towards 7th street, you can see all the trucks and the smoke. You can see the smoke pouring out of the now roofless building. This is not as dramatic as it was but smoke and flames where just puring out of these windows. This is looking east down Mission showing the sidewalk that I take everyday that is impassable due to the mountain of foam and waves of water just cascading out of the building. I can finally post a snap of some stitching.... the Lottery piece is done and waiting for the winner. Here is a snap. Corner. I really like it I made this from a free chart by Blue Ribbon Designs that I got in an order from Needlecraft, because not only is it fall (a favorite season) but because it has owls!!! I used the recommended GAST floss but the fabric is some I had and I do not remember what it is. I also got out the Birthday surprise today......it is going overseas so that might take a bit longer this time of year!!! This weekend I was finishing up some exchanges and watched quite a few movies. Now, as you all know I am a big movie fan and watch lots of flicks, mostly classics..... but Holiday films are some of my favorites. Saturday night was "Christmas Carol" night. The Charles Dickens story is at the very top of my all time favorite list of stories and I really enjoy all the visual interpretations of it that make it to film. I started off the evening with the 1938 Christmas Carol. What is interesting about this version is that June Lockhart and both her parents Gene and Kathleen are in this film playing Bob Cratchit, Mrs. Cratchit and their daughter Belinda Cratchit. Then it was on to the 1951 Scrooge, with Hermione Baddeley as Mrs Cratchit. Then to the 1999 TV version with Patrick Stewart playing E. Scrooge. Rounding out the evening with my all time, but not very good book interpretation but a 1970 musical version called Scrooge. On Friday I saw the 1984 version with George C Scott and the 2000 TV version "A Divas Christmas" with Vanessa Williams. There is a very good TV version called "Ms. Scrooge" with Cicely Tyson set in the mid 20th Century that is not out on DVD but it does come on TV occasionally so if you can catch it it is worth a look. There are other versions out there but these are the ones I really like. Then last night was "other Holiday film" night..... starting with "The Homecoming" A Christmas Story" the pilot for the Walton's series and finishing the movie extravaganza evening with 1954's "White Christmas." Then it was over to "Family Guy" and "American Dad" two shows that I wont miss and AD was the Christmas show and really very funny!!!! Still working on some exchange pieces. It is a bit larger than I had anticipated so is taking a little longer. While stitching last night I did not watch the reruns of Ugly Betty or Greys Anatomy, when I first see the shows it make me crazy so I am not going to go through it for the rerun.....and with the strike it looks like a reruns ahead, matey!! But I did watch a movie, and great big soap opera of a film called "The End of the Affair," 1955. Set in war torn a blitzing London during WWII it is about an illicit affair and jealousy. I really like Deborah Kerr and had never seen this flick, not the best and it has been remade in 1999 using the same name, I will need to find this and see how well Julianne Moore did in the DK roll. Do you do anything special to your threads before putting them through your fabric to make them more manageable? I have started to use Thread Heaven and the floss be it silk or cotton does seem to get less twisted and I can use a longer thread, probably too long. We went shopping last night, what a mad house. We left right after I got home from work and it was still pretty packed and crazy with all the people. That just got worse the longer we were at the mall. I did quite a bit of stitching after we got home but there are no snaps as it is an exchange piece and I am not sure they don't check in here occasionally. Thank you all so much for the kind things about my Grannies stuff. I really do enjoy getting them out every year. It brings back such super memories. This is the time of year that we draw close to family and friends and remember the past while looking toward the future. I think it is imperative that the same rituals be followed be they hanging stockings, eating candied peel or just the same old Syllabub served on Christmas Eve, something that my Southern family has done since my 81 year old Mom was a girl and had Christmas yearly with her Grandmother in Tarboro NC. We all crave the same old thing and repeat the cozy and comfortable. That to me is Christmas. Well, all of the e-mails for the SBBC are out there, that took a little longer than I thought, but is well worth it!! I am so happy that everyone has been so encouraging with my working the club. I wasn't sure if I could do it, but ya know once I put my mind to it....just buckling down and get-r-done attitude prevails and I seem to be pulling this sucker off!!! I was kind of intimidated sort of like the way that borniscu thing intimidates me!! In fact we went over to Needle in a Haystack yesterday after work and got some stuff, but Mary, sweet Mary showed me this pattern by Just Nan of a Christmas Borniscu and isn't it just the prettiest thing. I was verily tempted but stopped myself before I succumbed to temptation. I will probably go back after Christmas and get that sucker!!!! It is calling my name....... I can hear it...... :) off on a tangent...surprise! 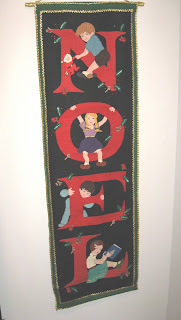 I did take some snaps of my Grannies old Christmas things and here is the Noel banner. This is about6 feet long and made of felt pieces. She, my Granny, saw a banner like this in Rich's Department Store in Atlanta and copied it from that. She actually made two of them my sister has the other one that Granny gave to my Mom. This has been around as long as I have so it dates back to the late 50's early 60's. Here is a picture of the tree skit that she made. The base is some sort of red cotton and all the green is a kind of mottled felt. All the decoration is hand applied bugle beads, real pearls (she broke up a necklace she did not want anymore) and sequins. The edge is bound in a machine made lace stuff that is starting to show its age. This would have been made in the mid 50's and was from no pattern but from just cutting and doing. There is only one of these and it has been spotted over the years but I use it every year and will continue into the future. I also am pleased to show the finished stockings I made for my niece and nephew. I am very happy with the way they turned out. I do have to give a big THANK YOU to Sheldon for sewing these thing up. They are winging away to Vancouver now......along with other presents, keep watch Cissy! I had some questions from yesterday. The first is how the candle stay up on the tree....there are special little clip/cups that are brass/silvery and they snap/clip onto the end of a branch - these hold the candles. It takes about 10 mins to light them all. Von - there will be next year for the SBBC, look forward to having you!! Nela - with 61 people it would be impossible to make a list of every ones likes and dislikes for publication....I would suggest looking at the blogs and getting a feel for what people are stitching to see what people like or don't. She has spooky eye.... and is till frightened of the camera. Thanks for stopping by and for all the support!!!!! It truly makes it all worth it!!!! I have not disappeared, but have been checking and re-checking the list of participants in the BBC making sure that I haven't left anyone off. Signing up closed on Friday until next year for the BBC and the list grew to 61 people!! WOOHOO!!! That is way more people than I thought would want to be in the group. I am so very happy with the huge turn out!!!!!! I worked on drawing names and here is a snap of the mechanism that I used. I will be sending out e-mails today and tomorrow so they are on the way!!! Over the weekend we went to one of the annual Christmas parties that I always enjoy going to and always go (as you know I am a homebody and really do not care to go out into society, but for this party I make the exception)....it is an annual Christmas Party that is given by Chris and Mo. The spectacular-spectacular at their party is always a tree lit with candles. Now, I have known Chris for about15 years, all the way back to Ocala Florida, before we both ended up out here in San Francisco. He has always had giant trees lit with candles and it truly is a magnificent tradition that I wait for every year. Here are some snaps that in no way do this spectacle justice. Chris gets these candles from somewhere in Germany. They are special low burning candles made to go on a tree. If you have never seen a tree lit by candles it is truly something to behold!!! That's about it ..... on the stitching front nothing that I can show right now as it is all for exchanges and presents. Well, we have arrived at the last day to sign up with the BBC. I will be closing it tonight and assigning partners this weekend and hope to have all the information e-mails sent out over the next few days. Carol asked about what we/I did with the Christmas cards that we receive every year. I keep many of them. Especially the handmade ones or the picture/photo ones. I have lots of those in my big secretary. I do that with many cards during the year not just from Christmas. I have some cards that were sent to me by friends from years and years ago...even back to when I was in college and before. I am a total pack rat like that. I have letters and cards from my grandparents that they sent me for birthdays and different events from 30+ years ago, and now that they are no longer here they are nice to have around. I treat all handmade things like that. My paternal grandmother was a great crafter and I have many cards/letters and things that she made over the years. She has been gone almost 10 years now and I wouldn't trade these bits of paper for anything in the world. The other more mundane or store bought cards I will keep until the next year when I do the cards again and then I will either make tags for presents or some other crafty thing depending on what the actual cards lends itself to. Whatever is left over I will try and recycle. In the garage in our building there has in years past been a bin for recycling Christmas cards, paper and boxes. That was a lot of answer for such an easy question. I really enjoy doing the cards and will probably continue doing them. We have these windows that line the opposite wall from our doorway and it is here that we put the garland and stuff. Here is a snap of the hanging badge between the windows. And here is the wreath that my Mom sent us a few years ago. Rico did all this decorating so he is to get the credit. He also did the tree, also artificial, but I forgot to get a picture. We go back and forth between a real tree and a fake one... this year it was the fake one. I'll get a snap on Monday. We are using the tree skirt the my Grandmother made 40+ years ago and have the NOEL banner she made 50+ years ago hanging up in the stairway. I really like using family things every year. Have a great weekend, thanks for stopping by!!!!! I have just about finished my Christmas Cards and gotten them out. It seems that no matter how many I do I still don't get everyone. You know what I mean....you trot out to the mailbox and pull out the mail and there is a card from someone you forgot or left off the list from last year. One more day and the BBC will close. I have uploaded everyone that has sent me an email wanting to join and sent out invites to the blog. If you do not see your name or have not gotten an invite please let me know so that I can make sure that you are included or if you did not receive the invite or anything else - just shoot off an email. I worked a little on QC and here is a progress snap. This picture makes the linen look all wonky, oh well you get the idea! Well worth a look and an excellent film. I finished up my Christmas Cards last night so I did no stitching. I also worked quite a bit on the BBC. Remember that this Friday, December 7th is the last day to sign up. So if you had questions or anything please ask now. Because after the 7th the club will be closed for this year. I will try and get out the partner names and info over the weekend, fingers crossed!!! I am tying up some loose ends with last years club group. Lets all remember this is supposed to be fun, so PLEASE don't flake on anybody as that only causes hurt feelings all around. I hope everybody is doing well and that your week is going great!!! Just a short post today. I worked on BP last night as on Friday and Saturday I worked on Christmas cards and wrapping up presents to be shipped today and tomorrow. I have a lot of things to get out for overseas friends. Almost finished with the border then on to the filling in the middle.